Hand tremors can occur for a variety of reasons. Parkinson's disease, hypoglycemia, multiple sclerosis, hyperthyroidism, fatigue and stress can all lead to hand tremors. These symptoms often occur while your hand is at rest or if your hand is held in a certain position for an extended period of time. Hand tremors can be inconvenient and make performing daily tasks much more difficult. Hand and wrist exercises can help reduce your symptoms. Curing hand tremors largely depends on the underlying cause of your condition. Hand tremors have various underlying causes. Some tremors can be improved with exercise. Before beginning exercises for hand tremors, your condition should be diagnosed by your doctor. Treatment for an underlying condition, such as medication, may help lessen or completely stop your hand tremors. Your doctor may also prescribe occupational or physical therapy to help you cope with your hand tremors. Read more: What Are the Causes of Hand Tremors? Improving grip strength can help reduce tremors. Use a small rubber ball or exercise putty to strengthen the hand affected by tremors. Hold the ball or putty in the palm of your hand and squeeze for two to three seconds. Relax and repeat 10 times, working up to three sets in a row. Strengthen your hand and wrist by using a lightweight dumbbell. Use a dumbbell that's 1 to 3 pounds in weight. Position your hand and wrist — palm side up — over the edge of a table. Place the weight in your hand. Slowly move your wrist up and down 10 times. Rotate your forearm to a thumbs-up position and repeat the dumbbell exercise. Finally, perform the exercise with your palm facing the floor. Work up to three sets of 10 repetitions in a row. Participate in regular physical activity. Regular exercise can help lower stress levels, decrease your risk of disease and improve your overall health. According to the 2018 Physical Activity Guidelines Advisory Committee Scientific Report, individuals should aim for 150 to 300 minutes of moderate-intensity physical activity per week. Even if you cannot reach this target, significant health improvements can occur by increasing your activity level. Bearing weight through your hands can temporarily reduce tremors and help strengthen your upper extremities. 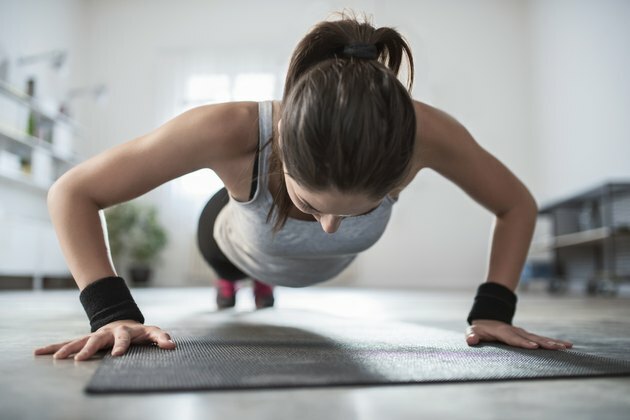 Perform body-weight resistance exercises, such as planks and pushups, as part of a regular exercise routine. Hand tremors can be reduced through the use of adaptive equipment and tools, making everyday tasks easier. For example, increasing the weight and diameter of eating utensils and writing tools reduces tremors. These items can also be strapped to your hand to improve stability. Wearing wrist weights for hand tremors can also improve your function. If using weighted tools is not effective for you, adaptive equipment is available to make daily tasks easier. For example, elastic shoelaces eliminate the need for tying. Long-handled combs can be used to groom your hair while keeping your elbow tucked against your side — another tip for reducing hand tremors. See an occupational therapist for further individualized recommendations for reducing hand tremors.